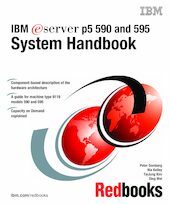 This IBM Redbooks publication explains the IBM eServer p5 models 590 and 595 (9119-590, 9119-595), a new level of UNIX servers providing world-class performance, availability, and flexibility. Ideal for on demand computing environments, data center implementation, application service providers, and high performance computing, this new class of high-end servers include mainframe-inspired self-management and security to meet your most demanding needs. The IBM eServer p5 590 and 595 provide an expandable, high-end enterprise solution for managing the computing requirements necessary to become an on demand business. This publication is an ideal desk-side reference for IBM professionals, Business Partners, and technical specialists who support the p5-590 and p5-595 systems, and for those who want to learn more about this radically new server in a clear, single-source handbook.